Honeysuckle Oyster Farm grows delicious, succulent oysters in the fresh, pure waters of Katama Bay on Martha’s Vineyard. The life of an oyster at HOF starts in early June when it arrives on the island by plane. Packed in a sandwich-sized bag, hundreds of thousands of oyster seed (each oyster at this point is 1.5 mm, about the size of a grain of sand!) are ready to start growing in their new home in the fresh, pure waters of Katama Bay. As the oysters grow they are sorted, thinned, and moved into larger mesh bins. After a few months of growing in the upweller, they are ready to be transplanted to mesh bags, which are then placed into cages set on the ocean floor of HOF’s 1 acre grow site. Honeysuckle oysters continually go through a process of thinning and sorting to achieve optimal growing conditions. Another key process that Honeysuckle oysters go through is the wind turbine powered tumbler. Oysters are loaded into the tumbler and then submerged into the water, where the tumbler cage spins, cleans, and gently chips off some of the newest shell growth. This helps Honeysuckle oysters to achieve a strong shell and a desirable deep cup. 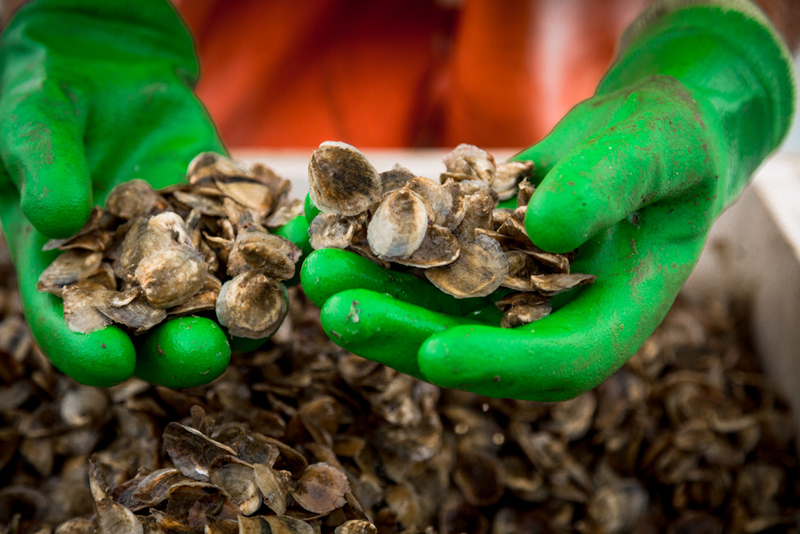 After being washed, every Honeysuckle oyster is hand inspected and packed into boxes. HOF hopes that the time and care taken to grow a Honeysuckle oyster is apparent as you enjoy each briny and sweet morsel!